Tints, while frustrating to work with sometimes, are indispensable for me. They're great for light makeup days and when you just don't feel like touching up too much throughout the day. I don't like using tint on my cheeks, but I do love using them on my lips! Since I no longer had any tints left in my stash, I knew I needed to stock up and decided to try out the Lip and Cheek Rollys (Php150.00 each) from local brand Sooper Beaute. I've been seeing these tints promoted on their Instagram and it's also one of their best-sellers, so I went and got a few shades from the line. 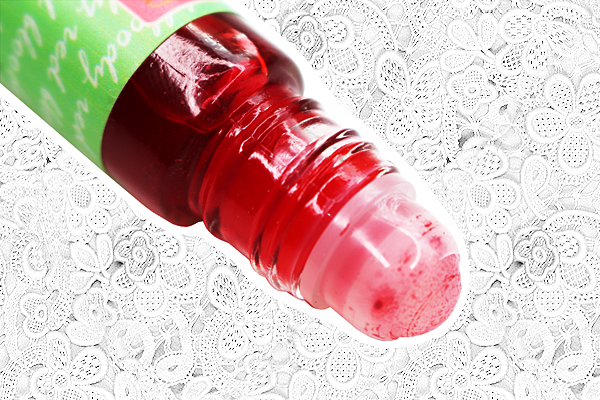 Lightweight formula creates a complimentary stain on the lips; delivers a flattering flush of color for rosy cheeks; nourishes and hydrates skin with vitamin E and jojoba oil; works as an anti-aging lip and skin treatment while you wear it. The tints come in seven shades: Blushing, Just Bitten, Bloody Red, Lust, Honey, Darling, and Crush. From the name, I'm sure you've already guessed the method of application for these is via a roller ball. While they don't make for the most precise application and sometimes dispense the product unevenly, they're still not all that bad to work with, especially if you take a little time to do so. 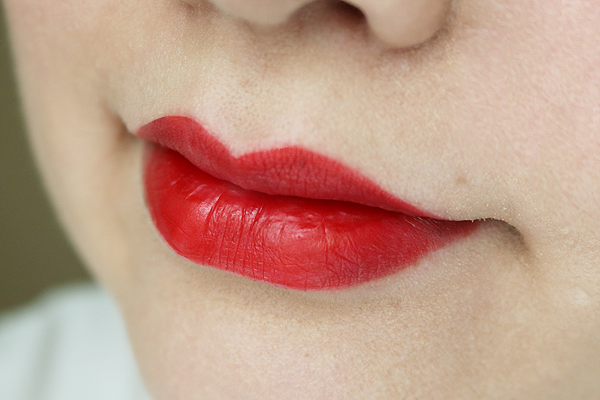 Since I have a very defined cupid's bow, I have to apply this carefully on my upper lip because like any tint out there, once this sets it will leave a bit of a stain behind and erasing any mistakes becomes difficult. When it comes to tints, I usually gravitate towards red shades so I chose three different kinds of red. I'll admit, I would chose 'Bloody Red' for the name alone! I also wanted to try their most popular shade 'Just Bitten', but naturally, it was sold out (at beautymnl.com). Oh well! Running them through CoSDNA shows that they're generally good and safe ingredients overall. On a scale of 0-9 on Safety, none of them go above a 5. Do take note though that the Jojoba Seed Oil and Triethanol amine are potentially comedogenic (acne/blackhead promoting), but they rate low with both having a 2 (out of 5) on the comedogenic scale and 0-2 (out of 5) for Jojoba Seed Oil as an irritant. If you're very acne-prone, this is just something to take into consideration when using as a cheek tint. 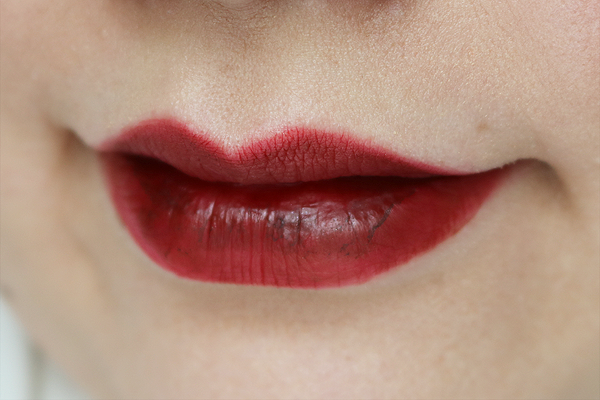 Bloody Red is your average but pretty red shade that would suit most skin tones. Like the two other shades, it's pretty pigmented and it almost looks like I'm wearing a lipstick here and not a tint. However, compared to the other shades, its wear time is the shortest. It still does leave a visible red-ish tint behind once it fades, but not as visible as Honey and Darling mostly because they're darker. Honey is the 'in between' shade out of the three I chose. It's a little darker than Bloody Red and something I'd wear more compared to the former. This leaves a more visible tint behind too, even after hours of wear and eating and drinking. I also think this is the most wearable shade as your average Filipina doesn't like sporting a red that's too bright and this would compliment morena skin tones more. Darling is probably my favorite shade, but I'm partial to darker colors anyway. Aside from that, this lasts the longest on me and leaves behind the most visible tint. I've worn this for an entire day multiple times, that included me eating full meals, and I never once had to retouch. I could have because yes, at some point into the day it will fade a little but the tint was still really visible so I didn't bother to retouch. Tints of this color or darker can easily emphasize dry areas like you can see in the picture, so just be sure to exfoliate your lips properly and/or apply a lip balm beforehand. 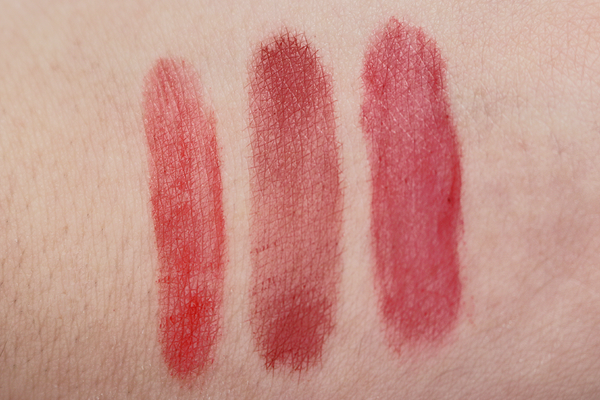 In fairness to the product, I took these swatches one after another and eventually my lips dried out from constantly (and thoroughly) wiping them clean and re-applying a different color. Plus, I didn't apply a balm nor did I exfoliate! All the shades last for hours, even when worn while eating, and leave behind a pretty to highly visible tint. Not a big fan of roller ball applicators in general, especially with lip products since the tint doesn't go on as precisely and as evenly as you want. All three tints, and tints in general especially if they're a dark shade, can emphasize or highlight any dryness on lips so be sure to exfoliate properly and/or apply a good lip balm beforehand to avoid that. The Lip and Cheek Rollys I got have the old packaging. Sooper Beaute recently (?) changed the label design and you can see the new one on the BeautyMNL website here.